For a true, modern driving experience, your vehicle needs to be equipped with the latest and greatest technologies. Thankfully, when you drive a new Chrysler, Dodge, Jeep, or Ram vehicle bought at our West Texas dealership, you have the opportunity to enjoy one of the finest technology suites on the market — Uconnect®. What is Uconnect®? This award-winning connected vehicle platform is built into many Chrysler, Dodge, Jeep, and Ram vehicles offering advanced connectivity, entertainment options, and navigation and communication features. 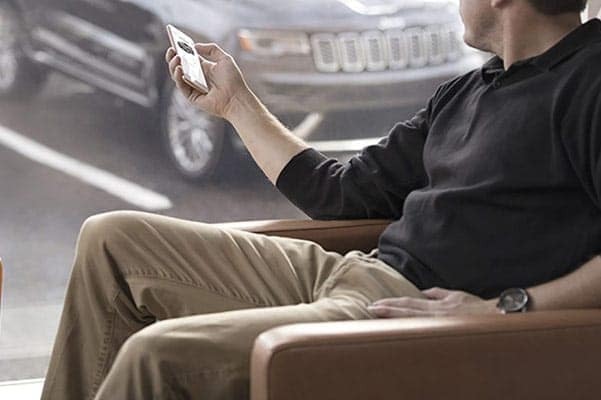 Powerfully intuitive and easy to use, the Uconnect® platform is a modern enhancement that could be yours when you visit our Chrysler, Dodge, Jeep, and Ram dealership between Lubbock and Sweetwater, TX. What features are included with Uconnect®? Many new Chrysler, Dodge, Jeep and Ram models include the available Uconnect® 4C NAV system, which can be accessed through a largest-in-class 12-inch touchscreen. This display includes full-screen navigation, music and on-demand content that can entertain you during your daily commutes and weekend road trips. You’ll even enjoy a customizable home screen with split-screen capability that allows you to accomplish two tasks at once, while features such as pinch-and-zoom technology make your Uconnect® experience easier. SiriusXM Guardian™ — Uconnect® blends with SiriusXM Guardian™ to deliver a driving experience you won’t soon forget. With features like remote access and control, roadside assistance, a 4G Wi-Fi Hotspot® and more, you’ll always be satisfied behind the wheel. Uconnect® Access — With available Uconnect® Access, you’ll stay safely connected on the road with features that act like your personal assistant. Uconnect® App — The Uconnect® App gives you access to a variety of intelligent features. You can start your vehicle from afar, lock or unlock your doors and even locate your vehicle in a crowded parking lot. Download the app from the Apple App Store or Google Play. Learn more about Uconnect® technology by visiting Blake Fulenwider Chrysler Dodge Jeep Ram Snyder! We’ll tell you more about the Uconnect® features that are available on new models like the 2019 Ram 1500 pickup and 2019 Jeep Cherokee SUV. Shop with us and get a well-equipped, technology-driven vehicle today!